Federal officials said they reunited 71 percent of migrant children 5 and older with their parents by Thursday's court-imposed deadline. Of the 2,551 children, 1,820 have been reunited with their parents or released to another sponsor in the United States, a court filing said. [post_ads]Judge Dana Sabraw of the Southern District of California ordered all migrant children separated from their families to be reunited after a lawsuit filed by the American Civil Liberties Union on behalf of some of the families. He gave the government until July 10 to reunite children under the age of 5 and Thursday for the older children. 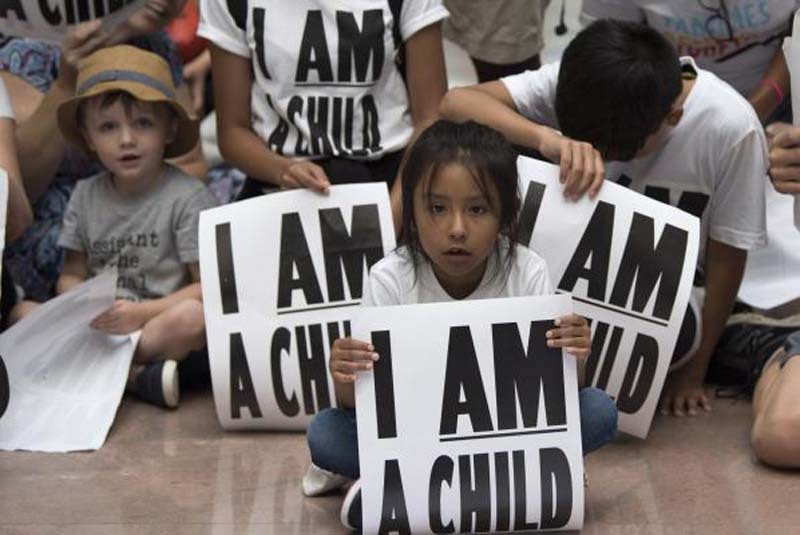 The court filing said there were a variety of reasons why 711 older children could not be reunited with a parent: parents waived reunification for 120 children; seven children and their families were involved in other litigation; 67 parents failed background checks or other case file reviews; 79 children's parents were already released into the United States and could not be reunited; 431 children's parents were outside the United States; and the location of the parents of 94 children was under review. Justice Department attorney Sarah Fabian said earlier this week the government believes about 463 parents have been deported without their children. "There may be more, it's not certain," Sabraw said. "But it appears there's a large number of parents who are unaccounted for or who may have been removed without their child." Politico cited an unnamed administration official as saying the Department of Homeland Security may not have given three-quarters of migrant parents the option of waiting for their separated child before they were deported. The official said the government failed to document whether the adults consented to leaving their child behind in federal custody. This could further delay the reunification of those 463 children, whose parents are unaccounted for. "If any parent has been deported ... without their child, that likely would be a scenario where the parent had actually asked that the child remain," HHS Secretary Alex Azar said earlier this month. The administration official, though, told Politico there's no documented proof that choice was offered to about 350 deported parents. The American Civil Liberties Union, which represents families involved in the case that set the reunification deadline, said in court documents Wednesday some parents are being asked to sign forms in languages they don't understand. Some migrants come from Guatemala, El Salvador and Honduras and speak indigenous languages unique to their area -- not Spanish. "Many of these individuals indicated that they felt coerced into relinquishing their rights," one lawyer said. "Still others appeared totally unaware that they had done so." In some cases, children have been sent to the wrong facility because of logistical errors, a government official told the Times. Since April, DHS has separated between 2,500 and 3,000 children from their parents after the Department of Justice announced a "zero-tolerance" policy to prosecute everyone who crosses the border illegally. "If you are smuggling a child, then we will prosecute you and that child will be separated from you as required by law. If you don't like that, then don't smuggle children over our border," U.S. Attorney General Jeff Sessions said in May. The new policy faced backlash from immigrant advocates and lawmakers from both major parties, and President Donald Trump eventually signed an executive order June 20 ending the practice of separating families. The order, though, didn't address how or when already-separated families would be reunited. On July 10, U.S. officials reunited more than half of the 103 children under the age of 5, but missed the deadline for some who were eligible.